Just kidding. You can finish reading this before you go buy them. 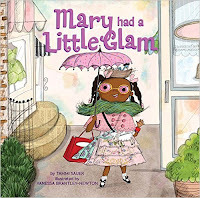 Mary Had a Little Glam is a rhyming tale loosely based on Mary Had a Little Lamb, but while this Mary does have a little lamb, it comes in the form of a wonderful accessory (a lamb shaped purse), not a baa-d animal. Sauer and Newton's Mary is appealing on several levels. She is, obviously, quite glamorous. She's creative and inventive (making curtains into dresses, finding glamour in natural objects like bird nests). But more than that, she is compassionate. She helps her friends - who you might recognize from other nursery rhymes - find their glam in a way that makes them happy and comfortable. When her fun makeovers meet an obstacle in the form of playground equipment, she doesn't abandon her dream of making the world more glamorous, throw her hands in the air and give up, or expect everyone to be happy with just being how she wants them to be. She leads the charge into giving up just enough "glamour" to happily play, exchanging her glamorous duds for a little less sparkle and a little more mud. But even as she is losing her accessories, we needn't worry about Mary's glamour. Mary has true glamour, "the attractive or exciting quality that makes certain people or things seem appealing or special," not because of her shiny necklaces and fuzzy boas, but because of her personality. Newton's illustrations are also quite refreshing. In a world where we, very unfortunately, have to have a hashtag and a movement to try to come up with a list of more than a handful of books that feature diverse characters, Newton has delivered a book filled with illustrations representative of the world we live in. As they should. How do you do that? Use the entry form below, and either tweet Get Your Glam On! with a picture of your own little "Mary" all glammed up with #MaryHadALittleGlam, and/or subscribe to follow Pickle Corn Jam via email. (MAKE SURE TO USE THE ENTRY FORM REGARDLESS OF YOUR METHOD OF ENTRY, OR YOU MAY NOT BE ENTERED!) Good luck!